If you happen to find yourself on a Delta Shuttle Service Flight on the West Coast of the US, keep an eye out for the delicious, healthy snacks being served on board. 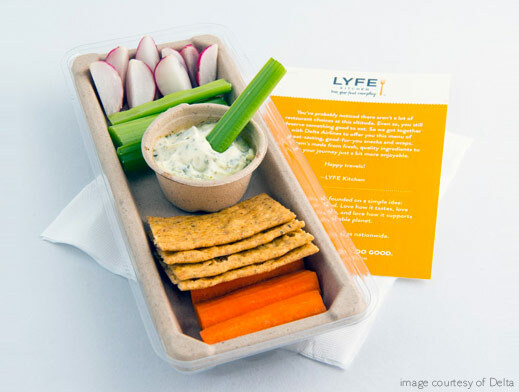 The new fare is the result of an innovative collaboration between Delta and LYFE Kitchen. LYFE is known for their sustainable, healthy cuisine and retail frozen food line. Delta took the sustainability one step further and decided to package the snacks in Be Green Packaging’s biodegradable and recyclable Sushi Trays and Sample Cups. Is this the future of airline food — healthy snacks served in sustainable packaging? We certainly hope so! By Paul Rogers, San Jose Mercury News, Calif. The lawsuit to be filed Wednesday, seeks to have tens of thousands of bottles of Aquamantra and Balance Water removed from supermarket shelves immediately. It asserts that the bottles used by those brands do not actually decompose naturally and that they contaminate other types of recycled plastic. Further, the suit states that their green-sounding labels could lead to increased littering if consumers believe that tossed bottles will decompose like apple cores or banana peels. The court action, filed in Orange County Superior Court, names ENSO Plastics, a bottle-maker based in Mesa, Ariz., along with the retail companies that sell bottled water: Aquamantra, of Dana Point, and Balance Water, of West Orange, N.J. The products of all three companies are found in stores across California and other states, including major grocery chains such as Whole Foods and Albertson’s. The complaint notes that in 2008, Gov. Arnold Schwarzenegger signed a law that bans the use of the term “biodegradable” on any plastic food or beverage packaging. The law, by former Assemblyman Mark Desaulnier, D-Walnut Creek, came after concerns that companies were making claims about container materials that could not be scientifically supported. Martin Chalk, a spokesman for Balance Water, said the company has been in contact with the attorney general’s office. Chalk declined to answer specific questions about the bottles, such as how long they take to decompose, whether they break down into the same basic organic components as food or whether they contaminate the waste stream when mixed with other types of plastic bottles. He referred specific questions to ENSO, the company that manufactures the bottles used by Balance Water. Representatives for ENSO and for Aquamantra did not return calls seeking comment. One of the state’s leading recycling advocacy groups cheered the action, saying it could resonate nationwide. But Murray said studies have shown that the type of plastic used in ENSO’s bottles—basic PET plastic, which is mixed with a microbial additive—doesn’t really decompose the way natural materials do. Bottles deemed “biodegradable” are different from “plant-based” plastic bottles recently embraced by Coca-Cola, Odwalla juice, Heinz ketchup and a number of other companies. Plant-based bottles are nearly identical to typical plastic bottles, which have the number 1 on the bottom but are made from sugar cane, corn and other materials instead of oil. They also can be recycled with traditional plastic, Murray said, while the “biodegradable” bottles have proved problematic. Byrne’s company, which buys flaked plastic from No. 1 PET bottles and turns them into clear plastic clamshell containers for strawberries, muffins, salads and other foods, said the biodegradable plastic causes the newly made containers to have slimy streaks.